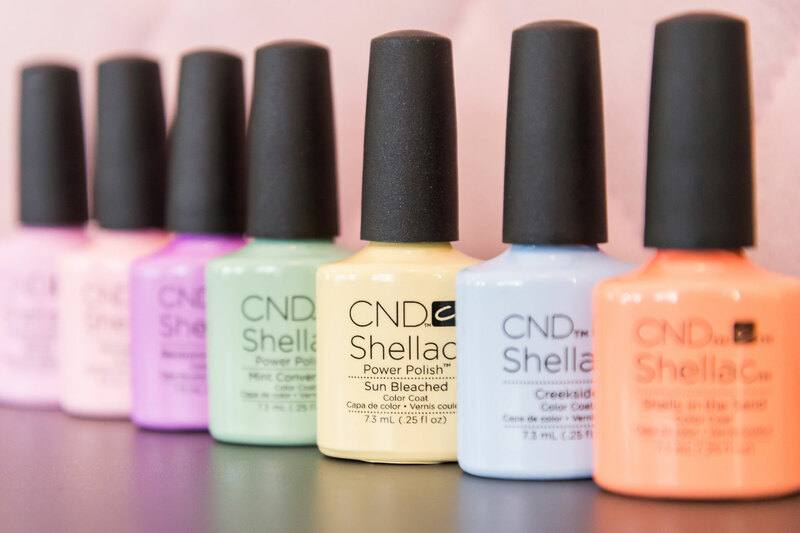 Using the orginal CND Shellac or the newer Candy Coat gel polishes. Gel Polish is a hard wearing nail polish which is cured under a light, it means your nails are completely dry when you leave the salon to ensure no smudging! The manicures include nail shaping, buffing and cuticle work too. A mirror shine, instantly dry and lasts up to 3 weeks! Shape. Buff. Cuticle Work. Gel Polish Application. Cuticle Oil. Shape. Buff. Cuticle Work. Gel Polish Application. Exfoliate Skin/Hard Skin Removal. Massage. Cuticle Oil. Using the orginal and best coloured gels, Biosculpture is a premium nail gel and is perfect for weaker nails and lasts up to 3 weeks. It is a thicker gel nail polish but not an extension. Shape. Buff. Cuticles. Gel Application. Cuticle Oil. Using CND's Vinylux nail polishes and the gorgeously scented Kaeso Spa Manicure Prodcuts. Shape. Nail Buff. Cuticles. Polish. Moisturise. Cuticle Oil. Shape. Nail Buff. Cuticles. Moisturise. Massage. Polish. Cuticle Oil. Spritz. Shape. Nail Buff. Soak. Exfoliate. Cuticles. *Optional Mask. Moisturise. Massage. Polish. Cuticle Oil. More than just a manicure…..Firstly your hands will be spritzed with an energising grapefruit drizzle spray, then will be soaked in a red berry hand soak to soothe and soften your cuticles. Hands will be exfoliated with a mulberry and pomegranate sorbet scrub, which deeply exfoliates and rejuvenates tired skin. A lush, rich, wild berry butter hand mask* will be applied to soften and to boost moisture levels. Your hands will be gently massaged with a cranberry sensation hand treatment cream to instantly restore and lock in moisture to dry, chapped hands. Your nails and cuticles will be shaped, buffed and trimmed, finally finishing with a a coat of CND Vinylux pretty polish. We are using the wonderful Kaeso pedicure products alongside award winning CND. Choose from CND's Vinylux, O.P.I and Ciaté nail polishes. Shape/Clip. Nail Buff. Cuticles. Polish. Cuticle Oil. Cream. Firstly your feet will be spritzed with an uplifting mandarin foot spritz, to energise those tired tootsies. Hard skin from the heels will be removed using a professional tool. Next, your feet will be soaked in a revitalising citrus and mango rejuvenating foot bath, before being scrubbed with an invigorating lime and ginger tingling foot scrub to slough away rough and tough layers to reveal fresh new skin. Your feet will then be cocooned in an intensely moisturising peppermint and blueberry foot mask to lock in moisture. Finally, a heavenly foot and leg leg massage using a soothing mandarin and mint yoghurt foot lotion, with the addition of menthol and peppermint to cool and refresh. You skin will be left soft as silk and you’ll be left feeling like you’re walking on air. Nails will be shaped and buffed, cuticles trimmed and finally, a coat of shiny polish. The ultimate in luxury - enjoy this with a drink of your choice! Nails are shaped, buffed and soaked in water with your choice of bath fizzer! You skin will be left soft as we'll remove any hard skin from the heels. Cuticles will be trimmed and tidied up. Completed with moisturiser and a pretty polish. Save money by combining treatments and having a nail package. We do packages for both natural nails and gel nails. Treat your little lady and yourself to a manicure/gel manicure, including kids champagne or a sparkly hot choc. Shape. Nail Buff. Cuticles. Polish. Moisturise. Cuticle Oil. + Shape/Clip. Nail Buff. Cuticles. Polish. Cuticle Oil. Cream. Shape. Buff. Cuticle Work. Gel Polish Application. Exfoliate Hands + Hard Skin Removal from Feet. Massage. Cuticle Oil. Shape. Cuticles. Nail Buff. Moisturise. Matte Polish. Shape/clip. Nail Buff. Scrub & Soak. Cuticles. Cuticle Oil. Cream. Try different styles: Complete coverage. Ombré. Feature Nail. Fades. Additives to change the gels colour and effect, some have small glittery pieces, so pretty. 100% REAL chrome with mirror like shine and 6 different colours. 100% REAL chrome with rainbow effect. Customise your nails with a hand painted set of nails or use a variety of our nail art methods above and also include foils or crystals too. We guarantee our gel nails for 3 days after our application and offer a complimentary repair if you chip one, as long as you pop in to show us your nail during that time frame. For anything else after this date it's £5. Buy a course of 9 treatments and receive your 10th one on us! Purchasing a bundle also entitles you to complimentary soak off's - usually £5 per treatment!